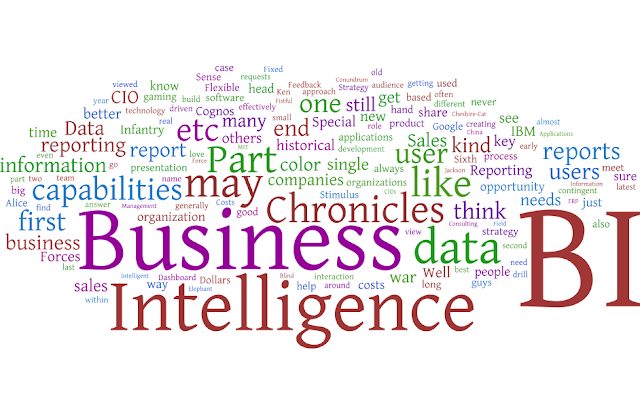 As I played with the new data visualization capabilities from IBM Research Labs (Many Eyes), I thought it would be nice to see how previous parts of The Business Intelligence Chronicles would appear in a Word Cloud and Phrase Net. The results are above. Many Eyes are Data visualization tools from IBM, currently described as an "experiment" from IBM Research and IBM Cognos software group. Site allows users to upload data and then produce graphic representations for others to view and comment upon. 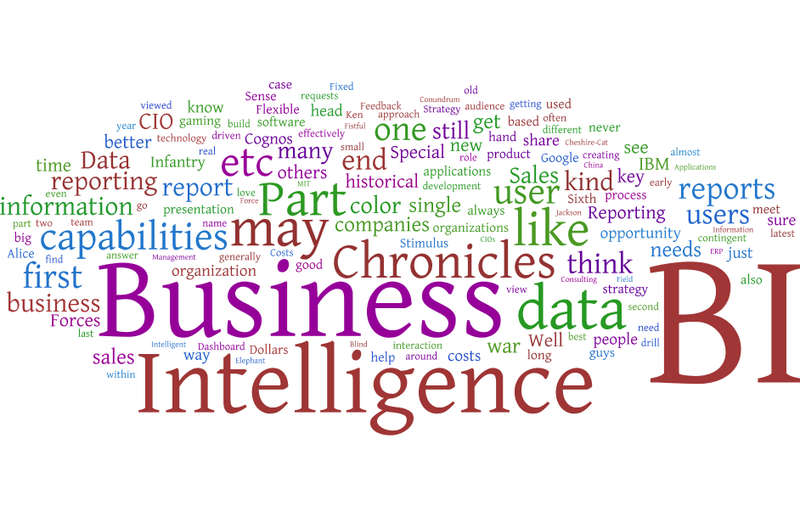 Word Cloud Generator was first published by Jonathan Feinberg on wordle.net. It was designed to give pleasure, and not to provide reliable analytic insight. That said, many people have found unexpected uses for it, from presenting the "gist" of a text to displaying personal identity. 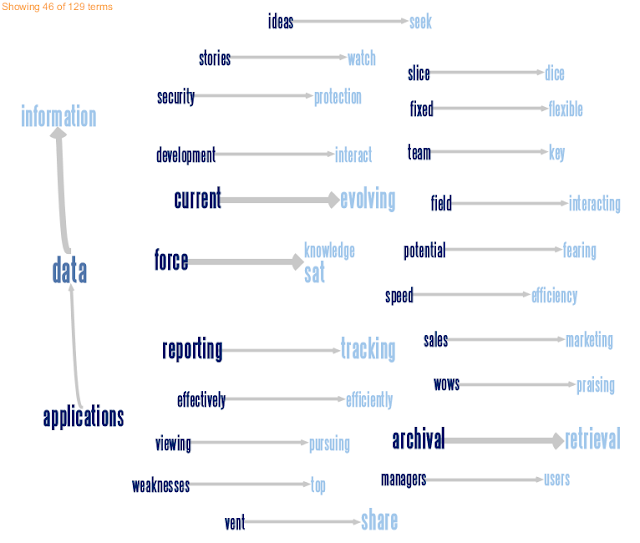 Word Cloud Generator draws each word at a size proportional to its frequency. At the risk of being the party spoiler, I don't really see the point of word clouds or phrase nets. Text contains much more relationship than what is conveyed by these drawings, which in the end are barely more than collections of concepts without hierarchy or structure. Let IBM continue its researches; the technology is not ready. Drawing a meaningful diagram from text requires understanding it, which for free-form text is still beyond the horizon. Formal text, on the other hand, can already be understood in all its levels of detail. Source code, for instance, is understood enough by the compiler for it to generate a working binary image, and there are tools that allow useful representations of aspects of the code. That is the key: "useful" and "aspects", i.e. view points. The output cannot be that useful if tries to represent the text completely and accurately: the only complete and accurate representation is the text itself. A tool that takes code and shows the class hierarchy (aspect) or the call tree (aspect) is useful to the software designer. A tool that takes a stats spitout and displays a bargraph is useful to the reader. More generally, visualization is what GUI are about, so, to answer the specific question, yes, visualization tools are useful for data interpretation and communication. 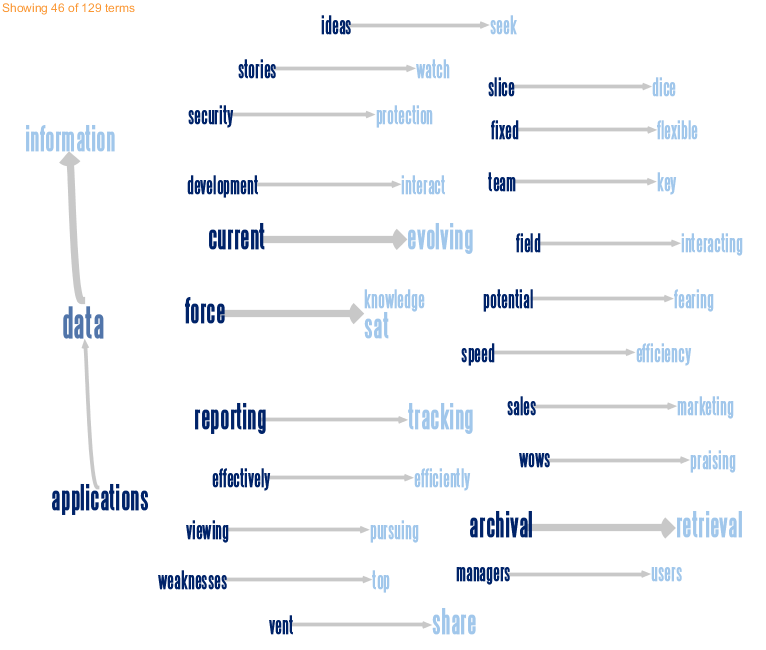 IMHO, word clouds and phrase nets are not yet there. I agree with Patrick. At the moment key text can be skim read with the added benefit of understanding the context. Furthermore, this does not require a skilled or trained user to do this. Word clouds or nets appear to restict the flow of knowledge to those who can interpret the medium and surely this defeats the object?